Creating networks that support fellows’ innovative activities. 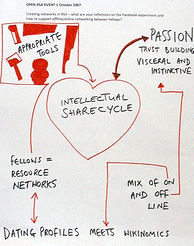 A mixture of ON and OFF line interactions is needed in creating an intellectual sharecycle. Sharecycle is built on the idea of freecycle (a market place where you exchange unwanted items) but rather than being a way to dispose of things you no longer need it is a market place where the exchange of valued information and networks is brokered. This gives rise to the idea of fellows as network resources rather than individuals with own agendas. OFF line, face to face allows more visceral and instinctive meetings where passion is expressed and trust is built. This could lead to incentivised engagement process - where the best projects, generating the most interest and the potential for real results are recognised and supported by the RSA. What does RSA do that’s different? Some thoughts: it offers access to powerful and influential; it could spread regionally if right structures are in place (building a ‘conclave’ of regional cardinals! ); it brings ideas and people together. What else is needed for ideas and people to create action? What’s missing? Reversing the core RSA processes so they are Fellow-centred. Facebook is the platform du jour – but it’s not perfect, and may be superseded sooner or later. We should be wary of putting all our eggs in one basket. How do we move from a social network to social impact? There’s a perception that the fellows are very good at conversation, but perhaps not so good at action (though it’s impossible to determine the degree to which good conversation acts as compost for actions that may not be traceable back to this origin). Trust is central. Fellowship confers a degree of trust between fellows. We need to build on this. Outside London and the metropolitan culture of some parts of the fellowship the emphasis on online networking is seen as exclusive (in the South Central region, for example, there are 800 fellows who are not on email). In discussion of whether it was possible to balance this out by encouraging offline fellows to create their own ‘exclusive’ network, there was a challenge to the idea that fostering inclusiveness in this way is either feasible or desirable. Thus, on the issues of exclusivity and inclusiveness were were inconclusive. Lot of discussion about the tools to support the RSA creating networks, getting networks to work together and collaborate and the process of using networks to develop from CONVERSATION to IDEAS to PROJECTS. Considerable interest in the idea of a Social Search Engine and how that might use the RSA Fellows as a resource. The RSA Fellows are a fairly unique potential network. High levels of trust and expertise. Issue is how to open up that network and use appropriate tools and activities (both online and offline) to enable it to become an engine for social change and innovation. Came up with the idea of SPACES within the RSA that could also overlap with others outside the RSA. Rough diagram below illustrates the idea of the 3 spaces and their relationship to the Fellows Network and the development of a tool to help access and develop activities in the spaces. Ideas Space = where ideas can be discussed, discovered, shared and perhaps coalesced around. Project Space = place to open up access to projects and people involved in them. The above is pretty rough and could do with further working out and mapping to tools and potential projects. In particular the idea of developing an RSA Social Search Engine that could be developed as a project - maybe even with commercial application! the project space for current projects or proto-projects.